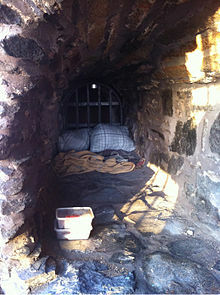 A homeless person's bed in Göteborg, Sweden, 2013. Homelessness in Sweden affects some 34,000 people. The Swedish government's response to homelessness has included commissioning national surveys on homelessness during the last decade that allow for direct comparison between Sweden, Denmark and Norway. The three countries have very similar definitions of homelessness, with minor variations. Some researchers maintain that measures to counteract homelessness in Sweden are largely dependent on a general premise equating homelessness with addiction, mental illness and deviance. On the other hand, youth homelessness is considered a child protection problem. There are several street newspapers in Sweden. Situation Sthlm, was founded in 1995 and was Sweden's only street newspaper until Faktum and Aluma were founded early in the 2000s. In 2006 the three street newspapers were awarded the grand prize of Publicistklubben (Swedish Publicists' Association). In 2013, a Swedish tech company created software for the homeless newspaper vendors to accept credit card payments via a mobile app. In 2015, a Swedish art exhibition at Malmö Konsthall titled “The Alien Within: A Living Laboratory of Western Society” included two homeless people from Romania. The homeless people were not accepting money from visitors but were paid at hourly rate by the event organizers. Researchers have found that excess mortality among homeless men and women in Stockholm is entirely related to alcohol and drug abuse. Some researchers have conducted studies on the oral health of homeless people in Sweden and found that they have fewer remaining teeth than the general population. ^ "A portrait of modern Sweden in ten statistics". 15 January 2015. ^ Vichea, Pang (2 September 2016). "Rebooting lives at the Homeless World Cup". ^ Löfstrand, Cecilia Hansen. "Reforming the work to combat long-term homelessness in Sweden." Acta Sociologica 53, no. 1 (2010): 19-34. ^ Healy, Karen, Tommy Lundström, and Marie Sallnäs. "A comparison of out-of-home care for children and young people in Australia and Sweden: Worlds apart?." Australian Social Work 64, no. 4 (2011): 416-431. ^ Boukhari, Sophie (1999). "The press takes to the street" (PDF). The UNESCO Courier. UNESCO. ^ "Röster åt utsatta fick publicistpris". Ekot (in Swedish). Sveriges Radio. 2006-05-22. Archived from the original on 2006-06-14. Retrieved 2009-02-11. ^ Gibbs, Samuel (18 October 2013). "Stockholm's homeless now accept payments - by debit card" – via The Guardian. 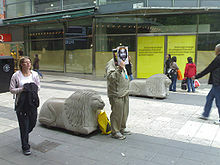 ^ "Are Homeless People Exploited in Swedish Art Installation? - artnet News". 2 February 2015. ^ Beijer, Ulla, Sven Andreasson, Gunnar Ågren, and Anna Fugelstad. "Mortality and causes of death among homeless women and men in Stockholm." Scandinavian journal of public health 39, no. 2 (2011): 121-127. ^ De Palma, Patricia, Lars Frithiof, Lena Persson, Björn Klinge, Jan Halldin, and Ulla Beijer. "Oral health of homeless adults in Stockholm, Sweden." Acta Odontologica Scandinavica 63, no. 1 (2005): 50-55.